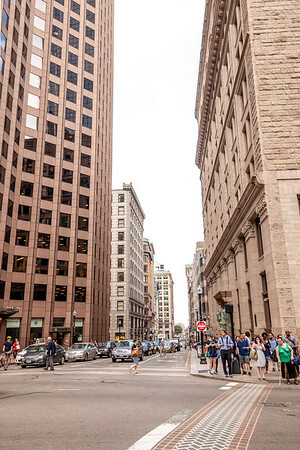 I was recently given the opportunity to travel to Boston, Massachusetts for a Marketing Conference. Little do a handful of people know, I'm not yet granted the option to do photography as my full time career. I spend my weekdays as a marketing coordinator for a commercial lighting company in Fort Worth, Texas. And personally, I love it. I'm lucky enough to love every inch of everything that I do. Marketer by day, and photographer by... well, nights, weekends, and anything in between. I was able to make my first trip to Boston last year and had very little time to brainstorm places to see, to go, and most importantly, shoot. This time I was way more adventurous. I had to make my debut blog post about some of the photographs I took. Photographs are worth a thousand words, but sometimes those words can't be heard until you know the history of the people, the times, and the place. Everything matters and these images deserve more than to stand alone. I spent my first bit of free time getting out of my introverted shell and taking a historic walking tour. A very tourist-y thing to do, but worth every penny! I'm a total nerd for history and those weird and worthless facts you always get from tour guides. On this particular day, Boston actually had their hottest day of the year. The temperature reached a high of 93 Degrees. Little ol'Texan me absolutely loved it. This is heaven heat to me, meaning I wish this was the hottest Texas got.The tour started at 3:00PM and I was there early. Deep down I was scared that I would be the only lonely person on the tour... How embarrassing that would be. Low and behold, I was not! There was eight other out of town tourists that snagged some tickets to hop on the tour. Anxiety successfully avoided! 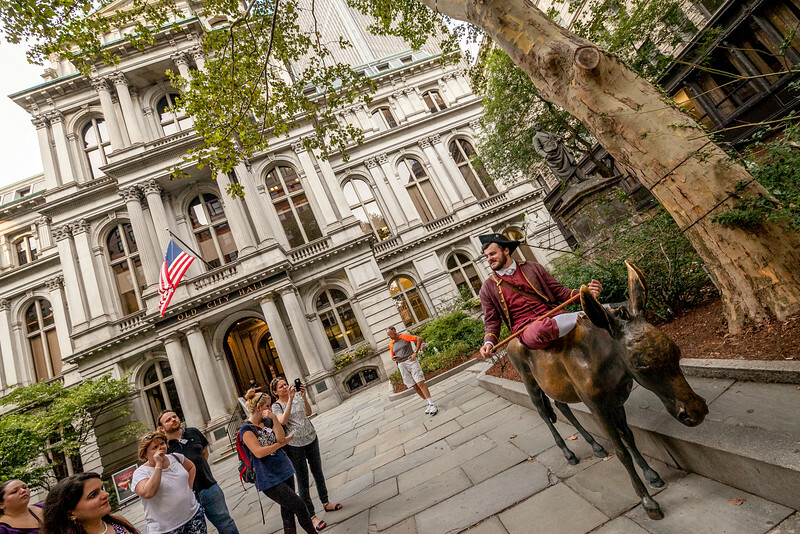 We started our tour in the Boston Commons and headed North towards Beacon Hill. 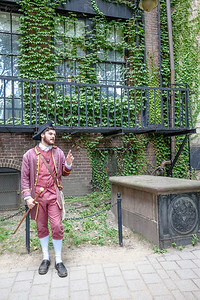 The tour guide eventually introduced his character dress as James Otis (Jr). James Otis is famous in the Revolution era for the catch phrase, "Taxation without representation is tyranny." We will learn more about Otis as the story continues. Though we didn't go too far up Beacon Hill to view the State House that lay ahead, we heard the beginning of many countless facts. The top of the State House (the dome) looks to be made of pure gold. It's bright as day, as if it were installed yesterday. 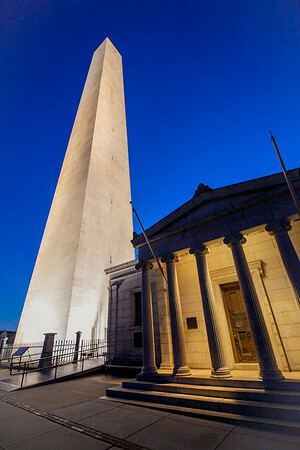 James (as I will refer to the tour guide) shared that the dome is plated in gold leaf, and is replaced every decade to continue to illuminate Beacon Hill. He also seemed estactic to mention that the taxpayers (him) were the one's that paid for that million dollar project (duh). Within the State House hangs the "Sacred Cod". Long story short, the Cod (Just over 4 feet long) was given to the State House as a gift from a local merchant and the Cod was such a prized possession and icon of the fishing industry, that (and I quote James) the "Sacred Cod" actually gets a vote on legislation. Yes, he said someone actually has to put in a vote for the Cod, a neutral vote nonetheless. Over the years, the Scared Cod has been stolen in order to avoid voting, because without the Cod's vote, no one can vote. Now, I sit here and tried to research a little more into this odd ritual, but I can't find anything about the Cod actually having a vote. But I like the story so I'm going to believe James' great storytelling! 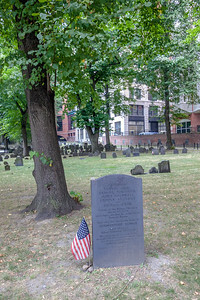 We continued on down Park St. and around the corner we hit one of the historic burial grounds in the city, if not one of the oldest in our country. 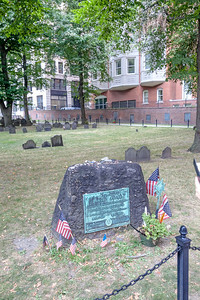 People such as John Hancock, James Otis, Benjamin Franklin's father, and Paul Revere lay in rest on the grounds. 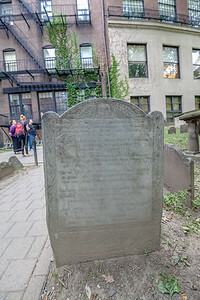 The first photograph in my series above is the grave erected for James Otis. Long story short, our tour guide actually said there was an ongoing conspiracy theory within the group of tour guides. The theory of why James Otis actually went crazy. So in his early years, James was well respected within the politics of Boston. As stated above, he spoke on the topic of taxation without representation. Standing up for what he believed in, one night at a bar, he got in a scuffle with a guy that pistol whipped him with his shot gun... His head was instantly cracked open. In these days, his chances of survival from something like this was slim to none. The conspiracy theory these guys have is that James was operated on and the part of his skull that was missing was replaced with either a copper or lead plate. Keep in mind that no one had any idea of the dangers lead had on the human body. Later on, James went "crazy", started talking to himself, streaked down the streets and eventually became a sort of loner. In a letter Otis wrote, he said that by God he would die by a "flash of lightening", and that he did. In 1783 he died on his front porch by a bolt of lightening. Don't know the significance? Remember that theory the guys had? Well that would be a great explanation of why he died by the lightening! And there you have it. I'll make the next stories short. 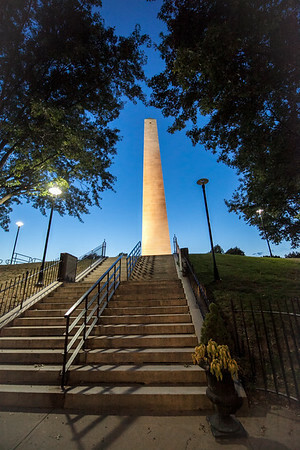 John Hancock has the biggest memorial on the grounds next to the Franklin memorial. I basically learned that he was extremely full of himself, rich, and wanted to be president to show off. (He later lost the seat of the first presidency to George Washington.) The Franklin Memorial in the cemetery is that of Benjamin's father, not Ben Franklin himself. A tourist trap you could say. 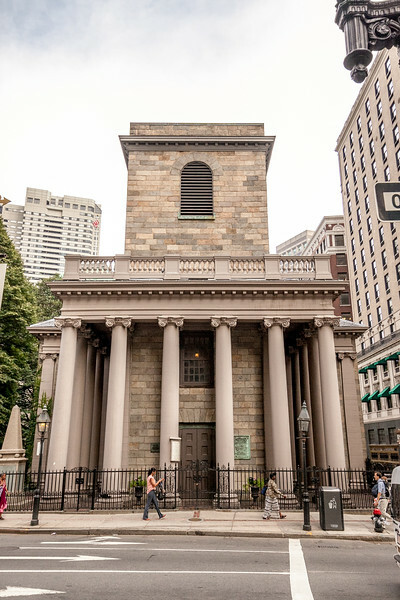 We went on passed King's Chapel (photo above) and into the King's Chapel Burying Ground. 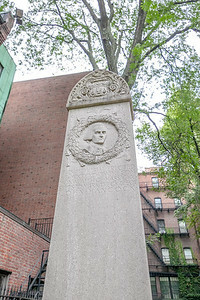 This burial ground has quite a few of significant people in the history of Boston including John Winthrop, Boston's first Mayor and the first woman to step off the Mayflower, Mary Chilton. 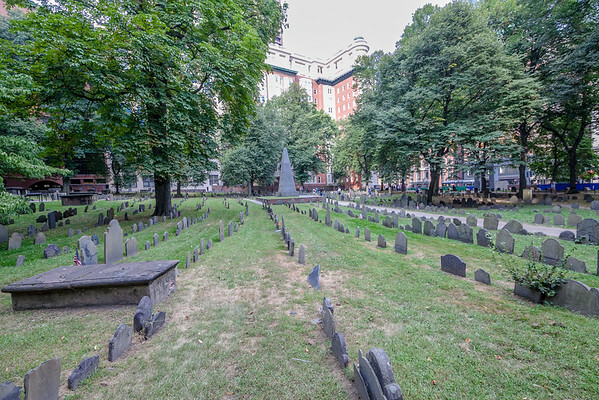 It's also Boston's oldest burial ground. It's gorgeous in a very iconic way. Otis (the tour guide) also told the group a very interesting and somewhat depressing fact about the old grounds in Boston. In short, all the headstones in the cemeteries are not in their original places. If they are, it's because of luck. During the 1800s the headstones were all removed from their original positions in order to create a more organized look as well as make room for better groundskeeping, aka the lawn mower. 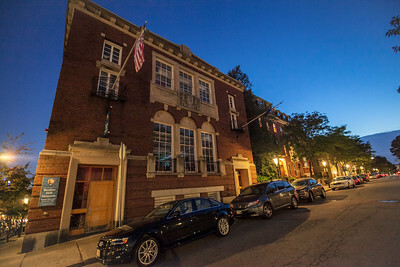 The Old Latin School is the oldest public school in North America and enrolled some of the greatest men in United States history, including Ben Franklin. Ben Franklin is also the most popular dropout of the school. Apparently, Ben wasn't a huge fan of Boston, he's not even buried in Massachusetts. Ironically, the tall statue that stands in front of the school today is a statue of Benjamin Franklin. As Otis puts it, Boston just can't let go of him. Something that is a "fun" photo opp here is the Democratic Donkey statue in the main walk of the building. Without hesitation, Otis climbed up on the statue and sat telling his stories. The republicans eventually had to have their fun too. At the base of the Donkey's head on the ground you can spot a plaque with two Republican's footprints with the words, "Stand in Opposition". (Photo on right) Next stop was the Old Corner Bookstore. 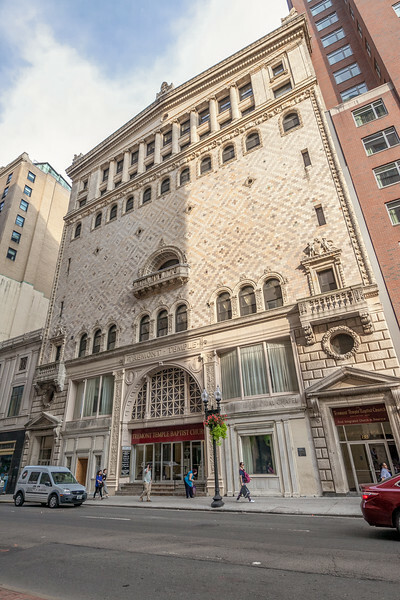 The building was built in 1718 and was later saved from demolition in 1960. 50 years later and it's a Chipotle restaurant! I just think it's great that the building is still being remembered and used for a pretty popular purpose. 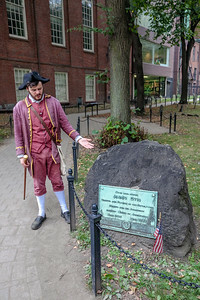 The site of the Boston Massacre is marked by a stone circle in the ground at the base of the State House. 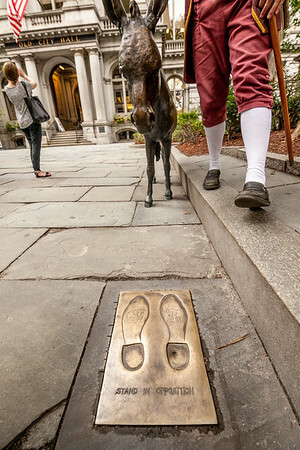 Though Otis said that the Boston Massacre site happened a few hundred yards across the street. It was obvious why it wasn't marked because it's located in the middle of a present day main street. There's no way I can sit here and tell you the detailed story that Otis told us, about how the massacre started. In short, it all started with an insult to the Red Coats and a misheard command. A handful of men were shot and they were given one memorial in the Granbury Cemetery that we toured through earlier in the tour. 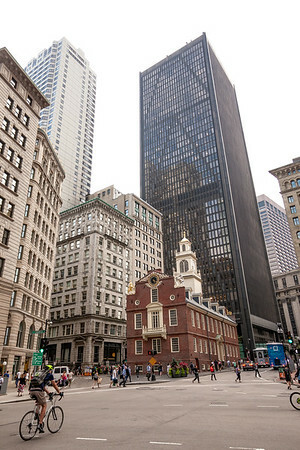 (Photo on the left) Faneuil Hall is probably the most popular social area in downtown Boston, at least for the tourists. 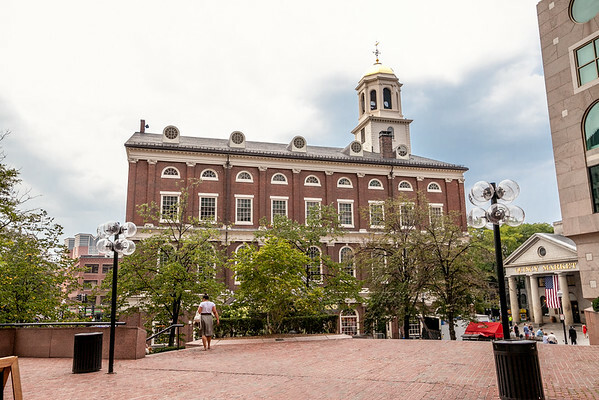 Faneuil Hall is known for it's historic debates that took place within it's walls. The first of which was the rebellion against the Sugar Act and the Stamp Act. 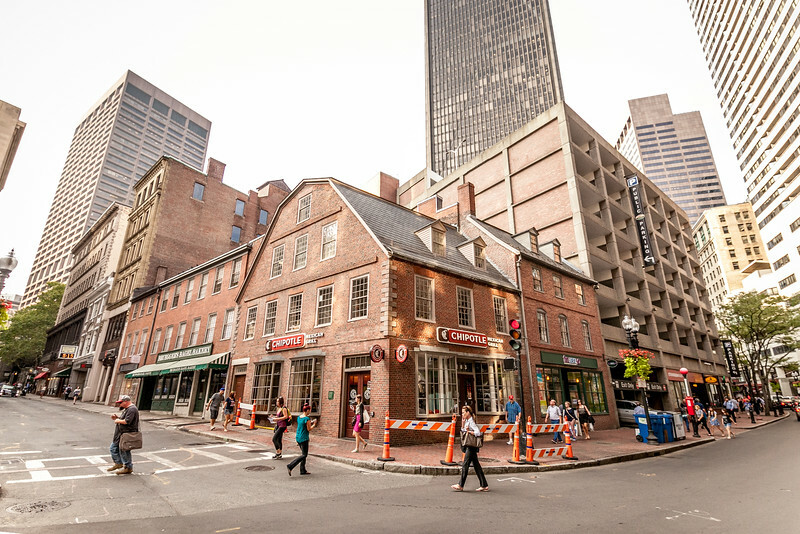 Across the way lies the Faneuil Marketplace. Today the walkways are lined with Coach and Michael Kors stores centered with a huge communal building filled with every type of food available. Probably the coolest tid-bit of information that Otis told us was the story of the Golden Grasshopper that is on the very top of the Faneuil tower. So Otis said, a few years back they were doing renovations to the roof and they accidentally dropped the grasshopper. It broke open and they found some old relics. Now... I don't know if this is actually true or not. There were certain stories this guy would tell and I would definitely glance around to see if anyone else believed what he was saying. And this was definitely one of those stories. The next day was extremely busy with my marketing conference and it ended around 6 PM that evening. I was determined to get out of my hotel room and venture around Boston on my own. I would have loved to of gotten a skyline shot of Boston, but of course with little research and not knowing a lot of Boston I was out of luck, haha. 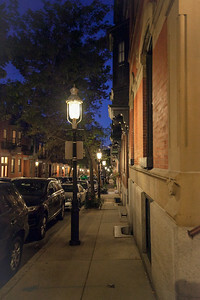 I decided to walk the last part of The Freedom Trail on my own and get some night photography out of it. I snagged a taxi and was dropped off at the USS Constitution/Boston Navy Yard in North Boston. I wandered around the Boston Navy Ship Yard, which is still an active base today, and came across a beautifully built mansion. The Commandant’s House which is pictured in the photo above. It was built in 1805 and I believe it is just a historical building not lived in presently. 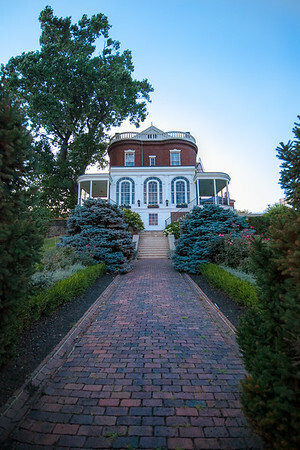 You can actually have the house as the location for your wedding which is pretty awesome. 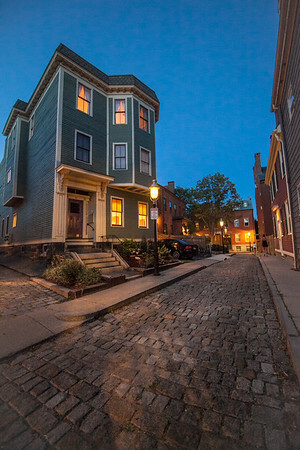 I was lucky enough to get to the historic area of Charlestown (where Bunker Hill and the USS Constitution are) right at golden hour and blue hour. The times when the light is golden and when the sky is the bluest of blues. 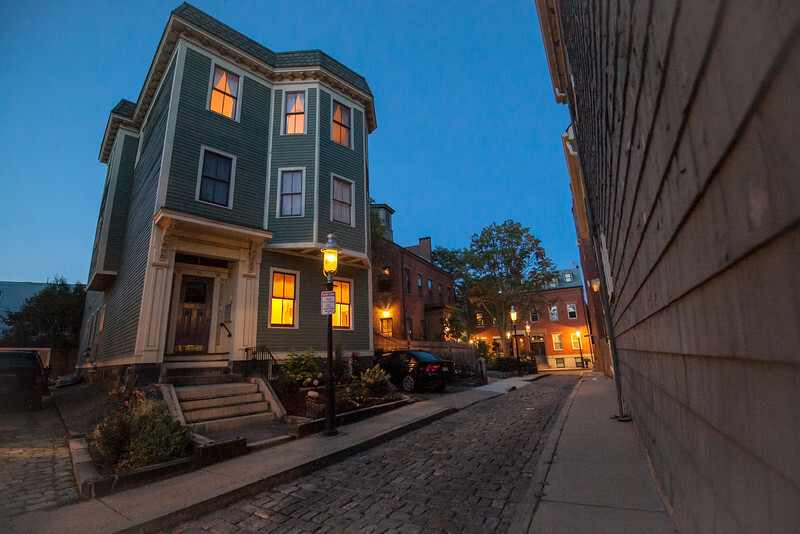 I walked around on foot in the most beautiful neighborhood, where some of the streets were still the original cobblestone paths and where only one car was able to drive on at once. 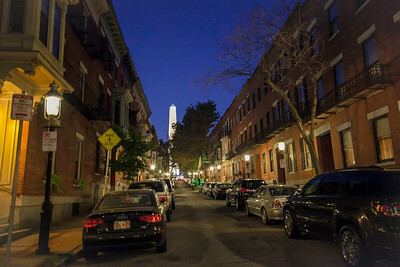 After walking around and taking a lot of photos of the monument and the streets of the neighborhood I was walking through, I started up on my way back towards Faneuil Hall, which was essentially my home base. I knew I could get a taxi back to my hotel there. 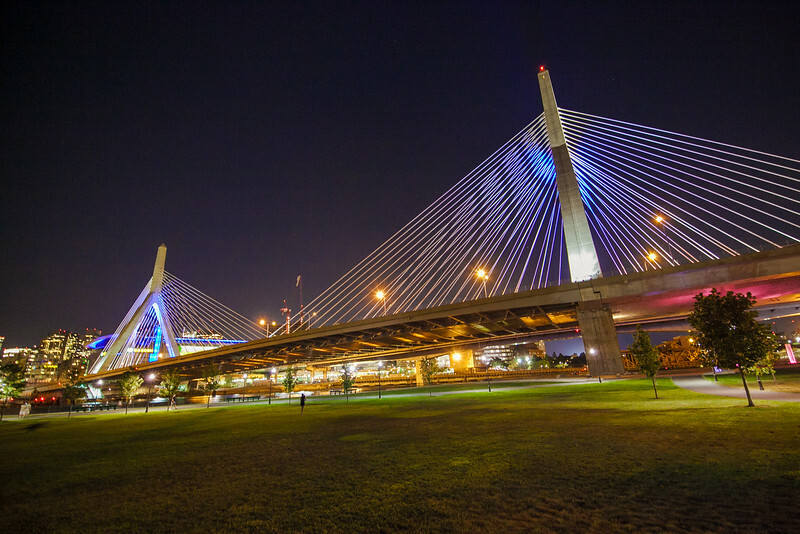 There was one last landmark I set my sights on getting a photograph of, and that was the Leonard P. Zakim Bunker Hill Memorial Bridge, aka the Zakim Bridge. 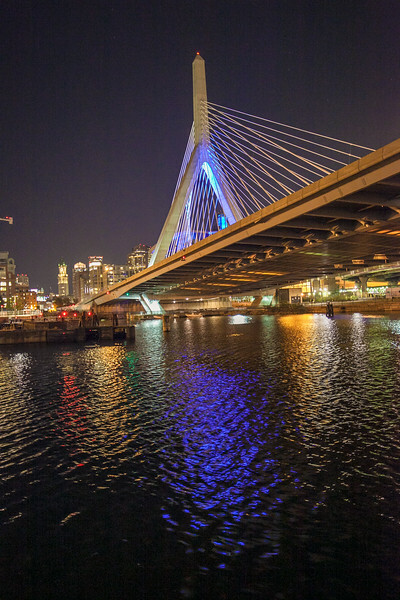 It's the bridge that connects Bunker Hill to downtown Boston and it has a huge open park with trails located right next door. People were outside playing frisbee with their dog, riding bikes, walking around. It was such a nice night outside at a chill 65 degrees. I didn't end up setting up my tripod for any super long exposures, but I managed to get some nicely lit shots just hand holding the camera. After my extreme leg work out, that I probably didn't need due to how big the Boston Convention Center is on it's own, I made it back to Fanueil Hall and caught a taxi back to my hotel. 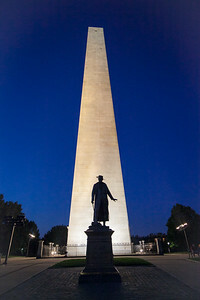 A trip to Boston is a must again, solely for photography adventures. 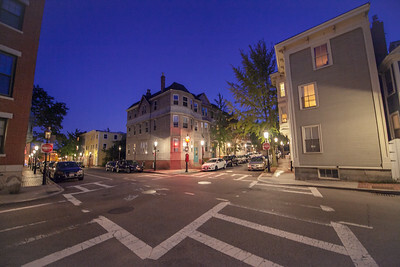 Salem is a fairly short drive away as well that I'd love to visit. Thanks for reading! Until next time.